Silver (chemical symbol Ag, atomic number 47) is a soft metal with a brilliant white luster that can take a high degree of polish. Along with copper and gold, it is one of the coinage metals. It is also considered a noble metal—a metal that resists corrosion. Of all metals, silver is the best conductor of heat and electricity. In nature, silver has been found in the free form as well as in the form of some compounds, and it has been extracted and used since antiquity. Culturally, silver has been associated with the Moon and feminine nature, while gold has been associated with the Sun and masculine nature. In addition, given its attractive white coloration, silver has been taken to symbolize purity. Silver is considered a precious metal often sold as an investment commodity. This metal and its alloys are used in making coins, jewelry, tableware, mirrors, printed circuit boards, and electronic products. The nitrate and halides of silver are valuable in photography. In addition, silver chloride is used as a cement for glass objects and in making electrodes to test the acidity of solutions; silver oxide is an electrode for watch batteries; and silver fulminate is an explosive. Elemental silver is nontoxic, but most silver salts are toxic when ingested at relatively high concentrations. At low concentrations, some silver compounds have been used successfully to prevent infections. Silver is found in native form and in various ores such as argentite (silver sulfide, Ag2S) and horn silver (silver chloride, AgCl). It may also be found combined with arsenic or antimony. The principal sources of silver are copper, copper-nickel, gold, lead, and lead-zinc ores obtained from Canada, Mexico, Peru, Australia, and the United States. Mexico is the world's largest silver producer. According to the secretary of economics of Mexico, it produced 80,120,000 troy ounces (2,492 metric tons) in 2000, about 15 percent of the annual worldwide production. Silver is produced during the electrolytic refining of copper. 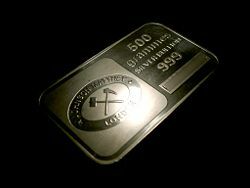 Commercial grade fine silver is at least 99.9 percent pure silver, and purities higher than 99.999 percent are available. The name silver is derived from the Anglo-Saxon seolfor (compare with Old High German silabar). Its chemical symbol, Ag, is an abbreviation of the Latin word argentum. Silver has been known since ancient times. Slag heaps found in Asia Minor and on the islands of the Aegean Sea indicate that it was being separated from lead as early as the fourth millennium B.C.E. Historically, it has been used for making ornaments and utensils. In addition, it has been used for trade and as the basis for many monetary systems. Its value as a precious metal was long considered second only to gold. In ancient Egypt and medieval Europe, it was often more valuable than gold. In the Bible, silver is mentioned as early as the Book of Genesis. In the New Testament, Judas Iscariot is recorded as having taken a bribe of 30 pieces of silver from religious leaders in Jerusalem to turn Jesus Christ over to the Romans. Associated with the Moon, the sea, and various lunar goddesses, the metal was referred to by alchemists by the name luna. One of the alchemical symbols for silver is a crescent moon with the concave part on the left (see diagram on the left). The metal mercury was once thought of as a kind of silver, though the two elements are chemically unrelated. The Latin name for mercury was hydrargyrum, meaning "watery silver," and the English name was quicksilver. Europeans found huge quantities of silver in the New World, such as in Zacatecas, Mexico and Potosí, Bolivia. The conquistador Francisco Pizarro was said to have resorted to having his horses shod with silver horseshoes because the metal was relatively abundant. By contrast, there was a relative lack of iron in Peru. Aside from that, silver was extremely valuable elsewhere, making it a global commodity and triggering a period of inflation in Europe. These developments contributed to the rise of the Spanish Empire. The rise and fall of the value of silver affected the world market. The Rio de la Plata was named after silver, after the Spanish word plata. In addition, Argentina got its name from the Latin word for silver. Silver mining was a driving force in the settlement of western North America, with major booms for silver and its associated minerals, particularly lead in the galena ore that silver is most commonly found in. Notable "silver rushes" took place in Colorado, Nevada, California, Ontario, and the Kootenay region of British Columbia. The largest silver ore deposits in the United States were discovered at the Comstock Lode in Virginia City, Nevada, in 1859. In the periodic table, silver is a member of the group of transition metals in period 5, situated between palladium and cadmium. In addition, it lies in group 11 (former group 1B), between copper and gold. Silver is a very ductile and malleable and is slightly harder than gold. It is stable in pure air and water, but it tarnishes when exposed to ozone, hydrogen sulfide, or air containing sulfur. It has the highest electrical conductivity of all metals, even higher than that of copper. Yet, its higher cost and tarnishability have prevented it from replacing copper for electrical purposes. Pure silver also has the highest thermal conductivity, whitest color, highest optical reflectivity (except for being a poor reflector of ultraviolet light), and the lowest contact resistance of any metal. In combining with other elements, its most common oxidation state is +1, such as in silver nitrate (AgNO3) and silver chloride (AgCl). In some compounds, such as silver(II) fluoride (AgF2), its oxidation number is +2. It also forms a few compounds, such as silver(III) persulfate (Ag2(SO5)3), in which its oxidation state is +3. Silver chloride and other silver halides are photosensitive and remarkable for the effect of light upon them. Oxygen dissolves in silver relatively easily, compared to other gases present in air. Attempts have been made to construct silver membranes that are only a few monolayers in thickness. Such a membrane could be used to filter pure oxygen from air. Isotopes of silver range in atomic weight from 93.943 atomic mass units (amu) (94Ag) to 123.929 amu (124Ag). Naturally occurring silver is composed of the two stable isotopes, 107Ag and 109Ag, with 107Ag being the more abundant (51.839 percent natural abundance). In addition, 28 radioisotopes have been characterized, of which 105Ag (the most stable) has a half-life of 41.29 days, 111Ag has a half-life of 7.45 days, and 112Ag has a half-life of 3.13 hours. All the remaining radioactive isotopes have half-lives that are less than an hour, and the majority of these have half-lives that are less than three minutes. Silver also has numerous meta states, with the most stable being 128mAg (t* 418 years), 110mAg (t* 249.79 days), and 107mAg (t* 8.28 days). The primary decay mode before the most abundant stable isotope, 107Ag, is electron capture and the primary mode after is beta decay. The primary decay products before 107Ag are palladium (element 46) isotopes and the primary products after are cadmium (element 48) isotopes. The principal use of silver is as a precious metal. The price of silver, however, has gone through dramatic fluctuations. Its salts, especially silver nitrate and silver halides, are also widely used in photography, the largest single end use of silver. Some other uses of silver and its compounds are given below. Some electrical and electronic products need silver's superior conductivity, even when tarnished. For example, printed circuits are made using silver paints, and computer keyboards use silver electrical contacts. Silver (silver cadmium oxide) is also used in high voltage contacts because it can minimize electric arcing. Mirrors that need superior reflectivity for visible light are made with silver as the reflecting material in a process called silvering. Common mirrors, however, are backed with aluminum. Silver has been coined to produce money since at least 700 B.C.E. by the Lydians, in the form known as electrum. Later, silver was refined and coined in its pure form. The words for "silver" and "money" are the same in at least 14 languages. The metal is chosen for its beauty in the manufacture of jewelry and silverware. They are traditionally made from the silver alloy known as sterling silver, which is 92.5 percent silver, usually alloyed with copper. The British monetary unit 'pound' originally had the value of one troy pound of sterling silver. Silver is also used in medals—usually denoting second place, after gold. The malleability, nontoxicity, and beauty of silver make it useful in dental alloys for fittings and fillings. Silver's catalytic properties make it ideal for use as a catalyst in oxidation reactions. Examples include the production of formaldehyde from methanol and air by means of silver screens or crystallites containing a minimum 99.95 weight-percent of silver. Also, silver (on a suitable support) is probably the only catalyst currently available to convert ethylene to ethylene oxide. The latter can be hydrolyzed to ethylene glycol, which is used for making polyesters—a very important industrial reaction. Silver is used to make solder and brazing alloys, electrical contacts, and high-capacity silver-zinc and silver-cadmium batteries. Silver fulminate is a powerful explosive. Silver chloride can be made transparent and is used as a cement for glass. Silver chloride is also a widely used electrode for testing pH (acidity or basicity) and potentiometric measurement. Silver oxide is used as a positive electrode (cathode) in watch batteries. Colloidal silver is a possible antibacterial/antibiotic treatment espoused in alternative medicine. It is, however, notorious for causing argyria, as noted below. Silver nitrate (liquid) was a standard of care but was largely replaced by silver sulfadiazine cream (SSD Cream) for the antibacterial/antibiotic treatment of serious burns until the late 1990s. Now, other options such as silver-coated dressings (activated silver dressings) are used in addition to SSD cream—they may present advantages such as pain reduction and capacity for treatment at home. In India, some foods and confectionery items may be decorated with a thin silver film known as Varak. Hippocrates, the father of modern medicine, wrote that silver had beneficial healing and anti-disease properties. The Phoenicians used to store water, wine, and vinegar in silver bottles to prevent spoiling. In the early 1900s, people would put silver dollars in milk bottles, in the belief that it prolonged the milk's freshness. Before the advent of antibiotics, silver compounds were used successfully to prevent infection, such as during World War I. The widespread use of silver in medicine went out of fashion with the development of modern antibiotics. Recently, however, there has been renewed interest in silver as a broad spectrum antimicrobial. In particular, it is being used with alginate, a naturally occurring biopolymer derived from seaweed. A range of silver alginate products have been designed to prevent infections as part of wound management procedures, particularly for burn victims. Silver plays no known natural biological role in humans, and possible health effects of silver are a subject of dispute. Silver itself is not toxic, but most silver salts are, and some may be carcinogenic. Silver (particularly colloidal silver) and its compounds can be absorbed into the circulatory system and become deposited in various body tissues, leading to a condition called argyria. This condition produces a blue-gray pigmentation of the skin, eyes, and mucous membranes. Although this condition does not harm a person's health, it is disfiguring and usually permanent. Argyria is rare and mild forms are sometimes mistaken for cyanosis. Silver ions and compounds have a toxic effect on some bacteria, viruses, algae, and fungi, similar to the toxicity of heavy metals like lead or mercury. For humans, however, they do not have the high toxicity associated with lead and mercury. Today, a variety of silver compounds, or devices to make solutions or colloids containing silver, are sold as remedies for a wide range of diseases. Although mostly harmless, some people using these home-made solutions use far too much and develop argyria over a period of months or years. Several cases have been documented in the last few years in the medical literature, including one possible case of coma associated with high intake of silver (see medical references). It is strongly advised to notify a doctor when taking silver as a form of self-medication. Given the mysticism surrounding silver's lunar associations, the aesthetic qualities of the white metal, and its association with purity, silver in European folklore has long been traditionally believed to be an antidote to various maladies and fictional monsters. Notably, silver was believed to be a repellant against vampires and the "undead" (deceased individuals who behave as if alive). In addition, it was thought that a werewolf, in its bestial form, could be killed only by a weapon or bullet made of silver. According to Eastern European folklore, the silver bullet was equally effective against vampires. These beliefs gave rise to the term "silver bullet," which is used to describe things designed to cure or fix a wide array of maladies. All links retrieved August 21, 2007. All links retrieved September 18, 2015. “Systemic argyria associated with ingestion of colloidal silver” by Akhil Wadhera, M.D. and Max Fung, M.D. This page was last modified on 18 September 2015, at 16:53.